We all want effortless shiny smooth hair. So let me tell you about some of my favorite products. 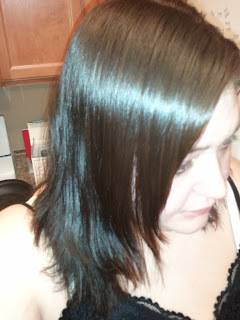 This will be a 2 part blog so I can take additional photos of the products in my hair and bring you a more complete review. The second part will focus more on glossing or shine creams. This post will focus more on smoothing creams and will highlight my three favorites. My hair is naturally curly, but was straightened today using TIGI Catwalk Straight Collection Sleek Mystique Heat protectant and a TIGI flat iron. If you've read my blog posts before you know I'm a huge fan of TIGI products which includes Bed Head, Rockaholic Catwalk, and S-factor lines. 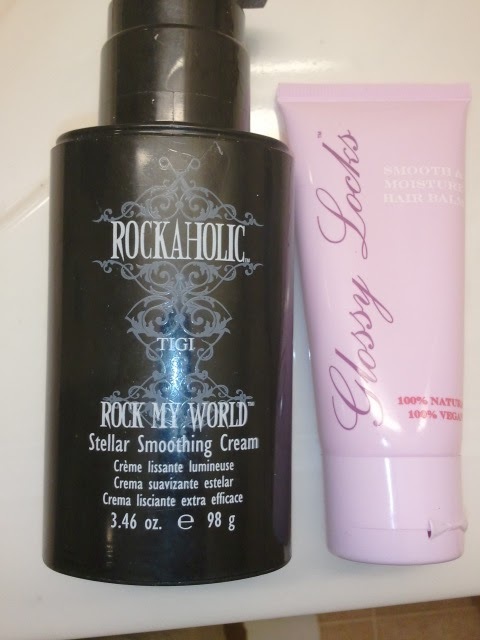 While my hair was wet, I applied TIGI Rockaholic Rock My World Stellar Smoothing Cream. You can use this product wet or dry and it acts as a heat protectant as well. (pictured below on left) Then the Catwalk Straight Collection was sprayed on while flat irnoning. 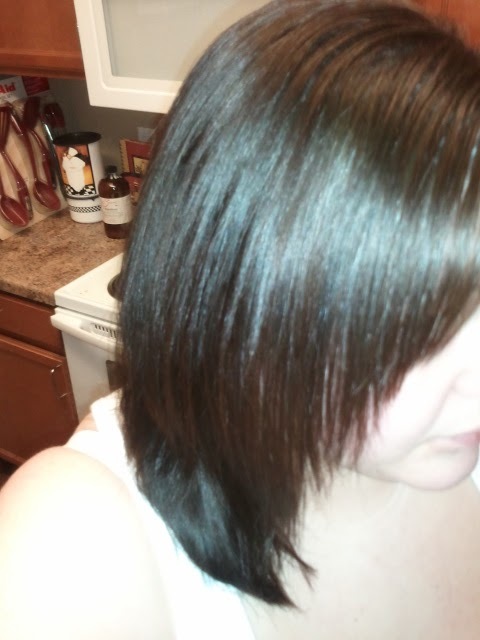 It is very important to use a heat protectant whenever blow drying or straightening your hair to minimize any damage. Another great product is 100% Pure Glossy Locks. This is a wonderful product and is also 100% Natural and 100% Vegan. It does have a strong smell and you only need a small amount of product. Applying too much product can leave your hair looking a little greasy. I like to apply this to the ends and the part where there may be some flyaways. If you're looking for natural, organic, vegetarian, and/or vegan products, be sure to check out 100% Pure. A lot of products have alcohol based products which can be very drying to your hair or other harsh chemicals. This is $15 for 2 oz. The only thing I don't like about this is that it has a stronger smell. Justina has this as well and likes the smell, so it is a matter of preference. Also, again don't apply too much or it can look a little oily or greasy. This can also be used as a heat protectant and can be applied wet or dry. The ingredients include Avocado Butter, Shea Butter, Coconut Oil, Cocoa Butter, Vitamin E, Vitamin B5, Rosehip Oil, and Lavender Essential Oil. These products also do not animal test and are cruelty free. Best part: You can actually read the ingredients on the back of the bottle so you know exactly what you're putting in your hair. 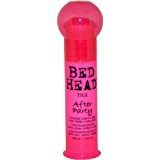 My third favorite smoothing product is TIGI Bed Head After Party Smoothing Cream. This is a fabulous product to apply after a long day if you don't have time to shower before heading back out, going to dinner, etc. This will make your hair look just as good as when you did it in the morning. It really restores my curls or smooths my hair. So stay tuned for Part 2 where I review some of my favorite shine serums/glossing creams including Fekkai and Rusk, Morrocan Spray among others!!! Here is a preview picture. 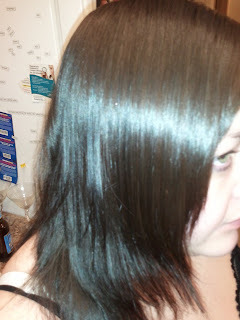 Can you guess which shine product I used to get this great shiny hair look? Subscribe to make sure you don't miss it! Wow your hair really does look sleek and smooth! !